The UTS Insearch English app provides an interactive, digital version of your Workbook. You can use the app anywhere, any time and it is available FREE when you enrol in Academic English! How do you access the UTS Insearch English app? The app is available on all mobile phones, tablets and computers with Windows 10. 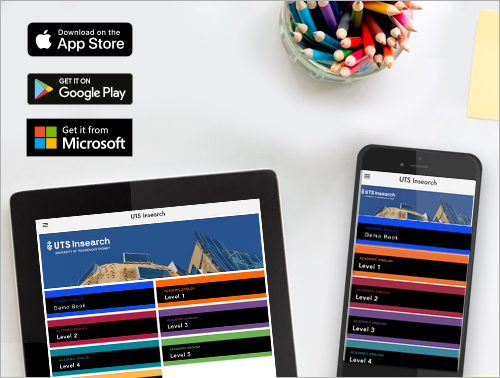 You can download the UTS Insearch English app through the App Store, Google Play or the Microsoft Store. Once downloaded, enter your login details and and you will be given access to the course materials for your course and you can start using the app to support your in-class learning!